Does our frequent use of the Lord’s Prayer result in it becoming a rote prayer with no power? Over the past couple of years, I have been taking communion on Sundays to residents of a local nursing home. One of the residents on the Alzheimer’s floor (we will call her Mary Jane) has always been eager to receive communion, but on a recent visit she became quite agitated and even accused me of wanting to kill her. I was shocked as was her attendant, who tried to calm and assure her that everything was fine. She would have none of it, and I retreated to call on other residents. I gave her communion, and then to my surprise, she said, “I love you.” I responded, “I love you, too, Mary Jane,” and gave her a pat. What a contrast to my prior visit! In reciting the Lord’s Prayer, Mary Jane may have been recalling a prior time in her relationship with God – perhaps in church, maybe in personal prayer or a family prayer time. We can only speculate what she may have been thinking, but it brought her peace and contentment. Why should we be surprised that this prayer, testifying to the kingdom, glory and power of God, awakens a soul ensnared in the darkness of Alzheimer’s disease? St. Paul declared, “For the kingdom of God is not a matter of talk, but of power.” (1 Co. 4:20) There is power in the Lord’s Prayer and God’s word. May we all be awakened! This entry was posted in Power of the Lord's Prayer, Uncategorized and tagged The Power of the Lord's Prayer on May 24, 2016 by Bill Dalgetty. Have you ever been cut to the heart by what someone says? That happened to 3,000 people who were listening to Peter on the day of Pentecost right after the Holy Spirit came upon the disciples. The Book of Acts reports that when the disciples were anointed by the Holy Spirit various physical phenomena were seen and heard – the sound of a roaring wind and tongues of fire seen coming to rest on the disciples as they began to praise God in different languages. Some who were present accused the disciples of being drunk, but Peter stands up and skillfully defends what is happening. He boldly witnesses to the resurrection of Jesus and the coming of the Holy Spirit. Quoting the prophets and psalms, he explains the historical basis for what God is doing in their midst. When we are “cut to the heart” by someone’s words, the Holy Spirit is usually convicting us of some truth or reality in our lives. We know deep within our being that we must act on what we have heard. Many years ago, at a Life in the Spirit program, I experienced the presence of Jesus Christ in a new and special way. While at first believing that this experience was real, I started to have some doubts. So, I sought prayer from one of the prayer teams to confirm that what happened was indeed real. I was cut to the heart by his words. While I had not shared with them what my doubts were, he spoke directly to them. How could he know what I was thinking? While I didn’t fully understand that evening what was happening, I later came to realize that the Holy Spirit had given him a word of knowledge for me, affirming my earlier encounter with the Lord and his forgiveness and love. Like the people Peter spoke to on Pentecost, the words of the priest became a watershed moment, leading me to put Jesus at the center of all aspects of my life, including my marriage, family and work life. While I don’t always meet the expectations of the call, my life has never been the same. God loves to speak to us in the words of others, in scripture, and in his quiet whisper to the heart. This entry was posted in Baptism in the Holy Spirit, Uncategorized and tagged Cut to the Heart by the Spirit on May 17, 2016 by Bill Dalgetty. Have you ever suffered multiple inconveniences due to an extended power outage? The lack of air conditioning on a hot muggy night; spoiled food from a refrigerator not working; eyes straining to read by candle light; groping for clothes in a dark closet — just a few of the inconveniences we are likely experience. In the same way an electrical power outage can make life difficult, so too will a Holy Spirit power outage be a challenge to live out our Christian faith in today’s world. This is exactly what happened to the disciples. They began to testify boldly to Jesus’ resurrection and experience the gifts of the Holy Spirit. These gifts included wisdom, understanding, counsel, knowledge and fear of the Lord, as described in Isaiah 11: 2-3, and faith, healing, miraculous powers, prophesy, discerning spirits and praying in different tongues, as described in 1 Corinthians 12:7-10. Just as Jesus affirmed that they needed the power of the Holy Spirit, so too, do we need this same power if we are to fulfill our calling as Christians, living out our faith day to day. While I received the Holy Spirit when baptized as an infant, it wasn’t until I seriously confronted sin in my life as an adult and people prayed with me for the release of the power of the Holy Spirit, that I began to experience God’s presence in deeper way. Only then did I begin to experience the fullness of the Holy Spirit and the reality of the gifts of the Spirit. All my priorities and values began to change. I no longer compartmentalized my life, putting Jesus in a box, but accepted his offer to dwell in me and brought him into every aspect of my life, including my family and work life. The Holy Spirit gives us eyes of mercy for the homeless person asking for money at a stop sign, a patient hand for the elderly person on the Alzheimer’s floor of a nursing home, and the gentle truth and encouragement for the inmate in the county jail. The Holy Spirit gives us patience to listen to a business colleague who needs to talk and empowers us to pray with a friend for the healing of a serious illness. If you are not experiencing the fullness of God’s presence and the gifts of the Holy Spirit, follow Peter’s advice in Acts 2:38, repent of any sin and pray for the release of the power of the Holy Spirit which you received in your baptism. Jesus said, “If you then, though you are evil, know how to give good gifts to your children, how much more will your Father in heaven give the gift of the Holy Spirit to those who ask him!” (Luke 11:13) All we have to do is ask. Do not suffer a Holy Spirit power outage any longer. This entry was posted in Power of the Holy Spirit and tagged Holy Spirit Power Outage on May 10, 2016 by Bill Dalgetty. In each of these instances it seemed to be the actions that these people took based upon their faith that brought forth a response from Jesus. Faith without action is incomplete. We need to act on our faith in order for it to have effect. It usually requires that we go out on a limb and risk failure, embarrassment, or disappointment. A number of years ago my daughters and I were water skiing in Uncle Tut’s boat in the sound between Holden Beach, NC and the mainland when the outboard motor conked out. He tried to start it several times, he fiddled with a number of adjustments, but nothing seemed to work. It was getting late in the day. There weren’t any other boaters in the area. He had no VHS radio, and it was a time before cell phones. We just sat there in the middle of the sound, unable to get back to the landing. I started to silently pray that the motor would start. Uncle Tut kept pulling at the starter cord, but nothing happened. I got a sense that I needed to pray out loud so Uncle Tut and my daughters could hear me. As Tut was giving it another pull, I shouted, “Lord Jesus, start the engine!” Varoom, the motor started right up. Uncle Tut, who loved to tell stories, told this story for years – how my prayer started his motor when nothing else he did could. Every day we have opportunities to act on our faith. If we see a questionable business practice, our faith in Christ should enable us to speak up for integrity. 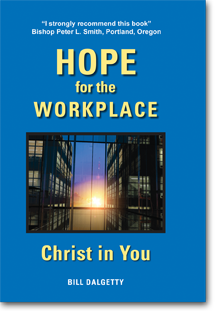 If a colleague is discouraged, our faith should motivate us to provide encouragement. If an employee needs to talk, our faith should be willing to listen. If we see a need for healing, our faith should be willing to offer to pray. If we need healing, our faith should be willing to ask others to pray with us. By giving us free will, God risked everything to become one of us in Jesus, counting on there being a few willing to follow him and carry on his work. How much are we willing to risk in living out our faith to carry that work forward? This entry was posted in Faith and Action and tagged Faith Requires Action on May 3, 2016 by Bill Dalgetty.